What’s your weather like? Can you say it in Arabic? At any rate, I’ve made up a few printables for learning words to describe the weather in Arabic (we may get to use it in context eventually, lol). 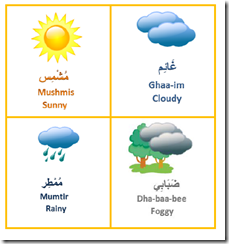 You can download the poster and cards over at TJ Arabic’s Arabic Vocabulary Weather Page . This set features flashcards for attached pronouns. Equates roughly to personal pronouns in English. Also included is a generic lesson plan. Flashcard set with generic lesson plan (adapted for this set of words as needed). Understand Quran has a neat resource of categorized vocabulary lists of 80% of the words that appear in the Quraan. My daughter has started on these lists, and I am hoping to make flashcards for each list. Here’s the first set, pronouns. 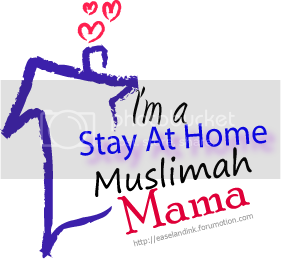 I’m hoping to make more as we go along, in sha Allah. There is also a generic lesson plan outline included in the file, which I think will be super helpful for teaching vocabulary, in general, insha Allah. I’m skipping lesson 2, the second set of color words for the present. Here’s lesson 3, with a theme of school things………. 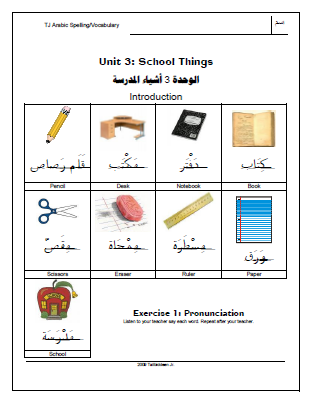 In the usual TJ fashion, I decided to turn the simple Arabic worksheets into something more……Arabic spelling and vocabulary lessons for my oldest daughter. We’ve been super stagnant on the Arabic, but I haven’t found a freebie book (or ones that we had on hand before we moved) that I liked well enough. 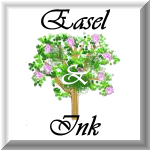 I’ve made a list of about 50 or so categories that I hope to make lists for (I’m sure I won’t get through all the lists, lol), but I am hoping to do a different word list each week at the very least (we’ll see how it goes). This is the first week’s lessons. 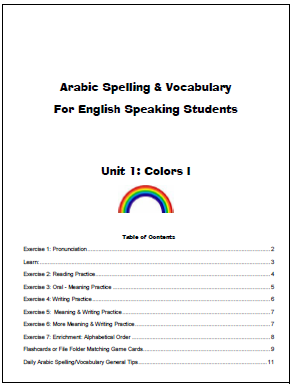 Again, its a springboard from the Arabic Color worksheets I posted yesterday.